Would You Like to Get More Fun Out of Your Exercise Equipment? What has happened to the stationary bike that you have purchased a few years ago? I bet, it is still gathering dust somewhere in the basement. What has stopped you from using it? Boredom is one of the biggest threats to regular exercise, and anything that can help take the edge off that boredom is a step in the right direction. If you find exercise boring or exhausting, the solution is to turn your traditional stationary exercise bike into an interactive exercise bike. Imagine an exercise bike that plugs into a computer or a tablet, and allows you to play a video game by pedaling. Computer monitor or television screen can add an extra level of entertainment to your workout. Cyber ExerCycle gives you access to endless number of games. Currently available interactive exercise bikes typically only offer limited number of activities. If you already own a stationary bike and a computer, why would you spend thousands of dollars on new interactive exercise equipment? If you don't have a bike, traditional exercise bikes can be purchased at a much lower cost. 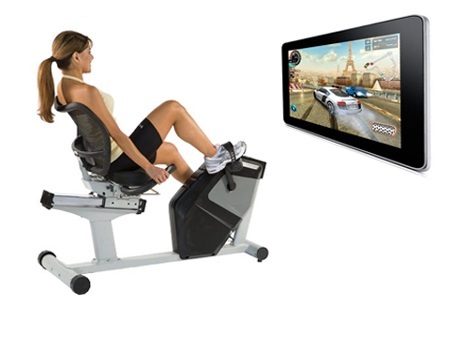 Cyber ExerCycle controller turns any exercise bike into an amazing exergaming bike. There are number of studies showing that exercising to video games has great benefits. Research conducted by Dr. Warburton from University of British Columbia is testing the hypothesis that interactive exercise equipment leads to greater exercise enjoyment and in turn larger health benefits in comparison to traditional forms of training. Exergaming can benefit your mind as well as your body. A recent clinical trial suggests that exergaming, combining physical exercise with video games, can yield a greater cognitive benefit for older adults than traditional exercise alone. Easy to Install, Intuitive to Use, Incredible Price. Simply attach a small sensor to the side of your bike and connect the controller to a USB port of your PC. Choose your favorite game and start getting fit. Your pedal motion controls the motion of your avatar within the game. Pedal forward to move forward, pedal backwards to move in the reverse direction. An intuitive nunchuk style joystick gives you an accurate control of direction and actions of your virtual character. We have provided a list of compatible driving and racing games. Many of them are available for a free download. You can get started exercising with no additional cost. 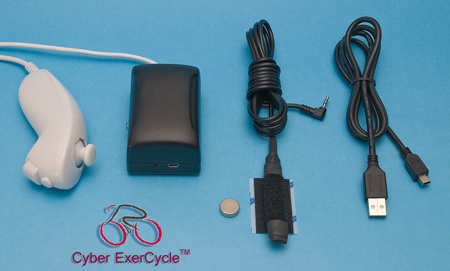 Cyber ExerCycle offers a complete gaming interface for your bike, at an incredible price. Copyright 2010-2018 © Universal Timer Ltd. All Rights Reserved.